This post goes from 1824 to 1916 and ranges from Kentucky to Kansas. Their kids moved around a lot and lived interesting lives. This information – except for Hannah Jane’s in her own post – comes from Rev. Mansfield, native of Kentucky where many Mansfields live today and intermarried with the Vickers. Also, Allan and Jeanette Cox put together a family history (Descendants of Samuel Vickers, 1984). Much of what they came up with has been updated, since the worldwide web has been up and running. He was born October 11, 1824, in Kentucky, though the census records vary the year by a little (see them below). His marriage certificate (see below) says he married Eliza Ann Mansfield on December 25, 1846 in Barren County, Kentucky. He died before October 19, 1887, near Hunnewell Township, Sumner County, Kansas, though one family history says it was July 7, 1886. James has a two-state journey, originating in Kentucky, where he was born, and ending up in Kansas, where he died. He and some of his family moved to Kansas between the 1880 Census, Elk Spring, Warren County, Kentucky (see below) and their daughter Jane’s marriage to William Ryland December 4, 1883.They followed their son Samuel who had already moved out West. James had only 10 acres at his passing (see probate section, below). James’s probate – legally confirmed in a court of law – shoots down the theory of one online researcher that James migrated to Texas and died there. His probate says he died in Sumner County, Kansas. She was born April 13, 1828 in Barren County, Kentucky, though the census records vary the year by a little. Her death certificate says she died January 8, 1916 in Barren County, Kentucky, and was buried the next day in Lockhart Cemetery. Family tradition from her granddaughter Vivian (daughter of Willis) says, “Grandma Vickers was an excellent quilt maker and made quilts for her family and grandchildren.” Apart from her pride in her children and grandchildren, we have a hunch that she would want us to remember her for this skill. She had a three-state journey: Kentucky and Kansas and back to Kentucky. 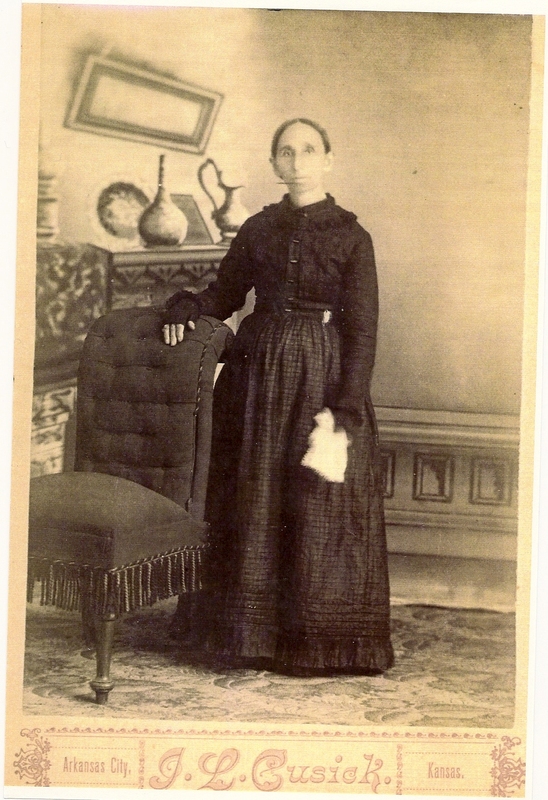 Her granddaughter Vivian (Willis’s daughter) says that after her husband died in 1887, she and her son Willis lived with her son John Vickers. But in the 1895 Kansas State Census and 1900 US Census she lives with her daughter (our) Hannah Janie. Eliza may have lived with one or two other family members between those years. Vivian says that after his father died, before long, Willis was able to live on his own. Reba May Vickers (b. May 27, 1904) was the oldest of two daughters of Willis Vickers. In Reba May’s family history, written on December 27, 1978, she recounts why Eliza Ann Mansfield Vickers decided to return to her home state of Kentucky. I have heard them [Reba May’s parents, Willis Vickers and Rosa Hubbard Vickers] tell how awful homesick grandma Vickers got to see her daughter nancy [sic] in Kentucky and she almost worried them to death and my father did not have the money to send her and Nancy didn’t have the money to send her either so finally my grandfather Hubbard thought it was going to be hard on my mother carring [sic] me under such conditions, so he paid for my Grandma Vickers railroad ticket to Kentucky. I think after my father was able some years later he paid him back. Since she lived a very long time, we have her death certificate. The informant was George Baldock, who is descended from her daughter Nancy, so he is Eliza Ann’s grandson. The certificate says Ann Mansfield Vickers, a widow, died in Voting Precinct 16, Smith’s Grove, Barren County, Kentucky. She was born April 13, 1828, in Hart County, Kentucky. Her occupation was “Housekeeper.” Her father was James Mansfield, born in Kentucky, and her mother was Frances Greer, also born in Kentucky. She died January 8, 1916, and was buried January 9, in Lockhart Burying Grounds (now Lockhart Cemetery). The cause of death was mitral insufficiency. She lived 88 years. A long life indeed. Note that it also says Mansfield. Barren County, Kentucky. The big day. Christmas day. Marriage. The (X) between the first and last name indicates that he signed with his mark, not his written signature. Their marriage license says they got married, Christmas day, December 25, 1846, Barren County. There is some confusion in family histories about their marriage date. They applied for the marriage license December 22, and a bond was signed the 23rd, so some researchers conclude they were married on the 23rd. However, the actual wording of the license says: “I certify that on the [erased: 24] 25th day of December, 1846 I celebrated the rites of Matrimony between the above named parties.” Plus, Rev. Thomas kept a record of the marriages he performed, and it also says December 25. Source: Barren County Court records. I Wilmer L. Hodges, Clerk of the Barren County COURT, do certify that the foregoing instrument is a full, true and complete copy as the same appears of record in my office in File #3 Book, ____ page ____. Wilmer Hodges, C. B. C. C.
By Elaine McGivie? D. C.
The condition of the above obligation is such, That whereas a marriage is shortly intended to be solemnized between the above bound James Vickus and Eliza Mansfield of this county. Now, shall it always hereafter appear, that there is no just cause to obstruct the said marriage, then the above obligation to be void, else to remain in full force and virtue. I certify that on the [erased: 24] 25th day of December, 1846 I celebrated the rites of Matrimony between the above named parties. Incidentally, Rev. R. W. Thomas performed other marriages in 1843-1847. She is our direct line, so see her information below or here. A lot of the following information comes from Allan and Jeannette Cox, two Vickers and Baldock researchers, in their booklet Descendants of Samuel Vickers, self-published, 1984. They got the information from hard research, but also from notes by Willis Vickers, who recorded the births of his siblings. She was born September 19, 1847 in Warren County, Kentucky; she married M. F. Crumpton on September 6, 1885, in Barren County, Kentucky. It seems we could easily find them in the censuses, but so far we have come up empty. Maybe they moved to a place we would least expect. She married late in her life. It was his second marriage. Her youngest sister is also named Mary, but her middle name is Emma. She was born December 13, 1849 in Warren County, Kentucky; she married Ambrose Baldock on December 24, 1871 in Warren County, Kentucky. The state death index says she died October 1, 1930, in Barren County, Kentucky. Family tradition says she is buried in Poplar Springs Cemetery. His death certificate says he was born November 29, 1845. He died April 8, 1930, at his home, in Barren County, Kentucky, and was buried April 9, at Poplar Spring Cemetery. She went by the nickname Nan or Nannie. She and her family left for Kansas in the early 1880s, but will return Kentucky sometime after the 1885 Census and before the 1900 Census. Her father died in 1887, so maybe it was after that. Eliza Ann will return to live with Nancy about 1902. In the 1880 Census, Elk Spring, Warren County, Kentucky, Ambrose Baldack (sic) is 36, a farmer, and from Kentucky. So are his parents. Nancy A. is 30, a housekeeper, and from Kentucky, as are her parents. Sallie B. is 3. In the “Cannot Read or Write” columns, Ambrose and Nancy are not marked, so they can do both. Kansas State has a mid-decade census. In 1885, Guelph Township, Sumner County, Ambrose Baldock is the head of household. He is a 40-year-old farmer from Kentucky. Nannie (sic) is also listed, but not her age. She’s from Kentucky too. Lizzie is 1 years old and also from Kentucky. If that place of origin is accurate for Lizzie, then they must have just moved, but it’s probably a mistake. But then they moved back to Kentucky. Nancy’s mother will join her after 1902. In the 1900 Census, District 19, Rocky Hill, Barren County, Kentucky, Ambrose (mistranscribed at ancestry.com as Anton) is 50, born November 1844 (sic), a farmer who rents his farm, and from Kentucky, as are his parents. Nancy A. is 50, born December 1849, whose occupation is not listed. Oddly, it is said she cannot read or write. She and her parents are from Kentucky. They’ve had 8 kids, 3 of whom are still living (does this mean, in their minds, living with them now? See the next census). Their son George H. is 13 and was born October 1886. He’s a farm laborer who can read and write. Their son James Y. (?) is 10 and born July 1889. He attended school in the past two months, so he can read and write. Ellen W. (?) is 8 and was born May 1892. She has attended school for the past two months, but cannot yet read and write. Everyone in the household are native Kentuckians. In the 1910 Census, Rocky Hill, Barren County Kentucky, Ambrose is 65 and a farmer on a “general farm.” Nancy A. is 60, and her occupation is “none.” They’ve had 9 kids, 4 of whom are still living. They own the farm (as opposed to renting it), but it is mortgaged. George is 23 and a farm laborer on the home farm; James is 20 and has the same occupation as his older brother; and Ellen is 17 and her occupation is “none,” but she attended school within the year. All are from Kentucky, and they can read and write. In the 1920 Census, Glasgow, Barren County, Kentucky, Ambrose Baldock is 75, and still farming on a “general farm.” Nancy A. is 70, and Nancy E. is 25 and their daughter. So Nancy A. had a child at 50. They own their own home, but Nancy A.’s and Nancy E.’s occupations are “none.” Everyone can read and write. In the 1930 Census, District 10, Temple, Barren County, Kentucky, Ambrose (85) and Nancy A. (80) live with their daughter Ellen (36) and son-in-law Malcolm Smith (39). He is a farmer on a “general farm.” Ambrose and Nancy’s sons George and James live on either side of them, per the census list. A short time after that census was taken, Ambrose will die. An image of his death certificate can be seen at ancestry.com. Nancy will die in October of that same year. Notes: Mary [sic] Ann Vickers (b. December 13, 1849 and d. October 1, 1930); Ellen Smith (b. May 15, 1892; d. October 30, 1959) m. Malcolm Baldock (b. May 15, 1890); Albert Baldock m. Josaphene (1841-1932); infant son (b. January 22-26, 1889), buried in Huffman Cemetery of Osie Miller farm. Source: Sandra Gorin, Deaths and Obituaries of Barren County, self-published, January 1991. He was born March 16, 1852 in Smith’s Grove, Warren County, Kentucky; he married Elizabeth Alice Baldock December 24, 1874, at the Beech Grove Church, Barren County, Kentucky. Family tradition says he died Jan 2, 1920 in Decatur, Morgan County, Alabama. She died May 3, 1919, Decatur, Alabama. They had resided in Athens, which is north of Decatur. In the 1900 Census, New Decatur, District 142, Morgan County, Alabama, John T. Vickers is 48, born March 1852, a railroad section foreman, and from Kentucky, as are his parents. Elizabeth A. is 50 and from Kentucky, as are her parents. They’ve been married 25 years. They rent their house. Freddie H. is 19 and born September 1880, with no occupation listed. John E. is 17 and born July 1882, and his occupation is difficult to read; Ruby F. is 15; Charles R. is 12 and born January 1888; Sylvester J. Grinstead is 20 and a nephew, whose trade is blacksmith; and Jessie M. Grinstead is 22 and a niece. Both were born in Kentucky. Everyone can read and write, and all the young people but Charles R. are from Kentucky. Charles is from Alabama. In the 1910 Census, New Decatur, Ward 2, District 166, New Decatur, Morgan County, Alabama, John Vickers is 58, works in the railroad shop, and from Kentucky, as are his parents (but not with them now). Alice is 59 and her occupation is not named, but she’s from Kentucky as are her parents. They’ve been married 35 years. They own their house free of mortgage. They can read and write. She was born December 11, 1855 in Smith’s Grove, Warren County, Kentucky. She married Prior H. Spradling between the 1870 Census and 1880 Census, in Warren County. She died before the 1900 Census was taken in Guelph Township, Sumner County, Kansas. He was born September 1835. In the 1870 Census, Elk Springs District, Warren County, Kentucky, Prior H. Spradling appears. He’s 33 and a farmer from Kentucky. His wife’s name is Mary W., and she’s 23 and also from Kentucky. Arlina (or Arliva) is 3. B. F. is 1. A black farm laborer named Isaac Campbell, 28, works with them. Surely this is Prior’s first marriage. Did he divorce Mary? Not likely. Epidemics ran through communities. But we just don’t know. In the 1880 Census, District 40, Edmondson County, Kentucky, Prier Sprdlin (sic) is a 45-year-old farmer who’s from Kentucky, as are his parents. Malinda is 24, a house keeper and from Kentucky, as are her parents. Lezia (sic) is 15 and cannot write. Benjamin is 10 and works on the farm. He can’t write, either. In the 1885 Kansas State Census, Guelph Township, Sumner County, Milinda, 28 (not 22, as the census transcription says), appears with P. H. Spradling, who’s 48. They’re married, and he’s a farmer. They’re both from Kentucky. Ben F. is 14 and attended school within the year; Tilden is 2; and A. M., a daughter, is 6 months. A. T. Waller is 20. Everyone is from Kentucky, except A. M. who’s from Kansas. So they moved after William Tilden was born in August 1883 (see 1900 Census, below), and before A. M. was born in July 1885 (see 1900 Census, below). On the previous page of the 1885 Kansas Census, Malinda’s sister Hannah Jane appears, living with William Ryland and their 5-month-old Floyd R. (Frank / Slim). In the 1900 Census, Guelph Township District 332, Sumner County, Kansas, Price or Prior Spradling is listed. He’s 64, a widower, born September 1835, a farmer, from Kentucky, and rents his farm free of mortgage. He can read and write. Benjamin F. is 30, single, born August 1869, from Kentucky, and a farmer who can read and write. William is 17 and from Kansas. He was born August 1883 (this is Malinda’s own child). He’s from Kansas, but his parents are from Kentucky. He’s a farm laborer who can read and write. Ada M. is 15 and was born July 1885. She’s been at school for the past two months, so she can read and write. So it seems Malinda died before the census was taken. Carl Frederickson, (our great-grandmother) Hannah Jane, (our great-great grandmother) Eliza Ann Vickers, Frank (our grandfather), and Bessie are found on the same page of the same 1900 Census. Amy, Archie, and Ella (Hannah’s three kids by Carl) are also in the household. There is a marriage record for a certain P. H. Spradling. He married Mrs. Lou Franklin, September 4, 1901. Ada M. Spradling married Charles H. Dow, May 18, 1904. He was born December 8, 1857 in Warren County, Kentucky (his grave stone says Dec. 8, 1859). He married Elizabeth K. Denton in the 1880s, in Kansas. He died in the Dalles, Wasco County, Oregon, 1899-1900. His grave stone says he died March 11, 1900. It also says he was a woodman. His younger sister Mary Emma moved to Ogden, Utah around 1898 or even a little after that, like early 1899. Mary Emma appears in the 1900 Census in Seattle, Washington, so she lived in Utah around 1899. After Samuel moved to the Dalles, Oregon, he exchanged letters with her, while she was in Utah, telling her to come out to Portland, Oregon (we don’t have the letters). But he does not appear in the 1900 Census, the Dalles, Oregon, though his wife and two kids do. She is said to be a widow. So, depending on how we date Mary Emma’s moves, he died about 1899-1900. Allan and Jeanette Cox compiled a family history on the Vickers and Baldocks. Wife: Elizabeth K. Denton resided at Summer Shade, Metcalfe County, Kentucky (no other information about her) Family tradition says that Samuel was the first of the family to move out West. He went to Texas in 1880 and stayed a while with William H. Mansfield and his wife, Mary, in Hays County. In 1881 he went to Kansas where he m. Elizabeth. They later returned to Texas, saying they wanted to make Texas their home. Selma was b. while they were there. They later moved to the Dalles, Oregon. These moves are confirmed by two censuses. Kansas State has a mid-decade census. In 1885, S. J. Vickers lives in Wellington, Sumner County, Kansas. He’s 26 (b. 1859) and a farmer. Some men listed above and below him are marked married, but others around him are left blank, in either the married or single column. Though the years are off, this is probably the right Samuel, since family tradition and the census agree, and several members of his family, including his parents, were out in Sumner County, Kansas at the time. His niece Reba (Willis’s daughter) says he moved to the Dalles, Oregon, before 1900. In the 1900 Census, the Dalles, Wasco County Oregon, Elisa Vickers, 40, is widowed. She’s from Kentucky. Her son Earl, 12, was born in Kansas, August 1887. Eliza’s daughter Selma, 17 (sic) was born in Texas, September 1892. Her age is marked wrong. It should be 7. It appears, then, that he moved to Texas around 1880. He moved to Kansas in 1881 and stayed there at least until August 1887. Then sometime after August 1887, they moved back to Texas long enough to for Selma to be born in September 1892. Finally, sometime between 1892 and 1898, depending on how we fix the dates of his sister Mary Emma’s timeline (see her story, below), they moved to Oregon. There is an E. C. Vickers, in the 1920 Census, Corvallis, District 7, Benton County, Oregon. She’s 59, a widow, and from Kentucky. She’s a boarder who keeps house. She lives with the Harris and Johnson families. Is this a match with Elizabeth K. Denton? The age, marital status, and origins fit. He was born September 7, 1863 in Warren County, Kentucky. Unfortunately, we cannot find him the censuses, unless he’s hiding in plain sight because his name is common enough. There is a James D. Vickers in the 1920 Census. He’s 56 (b. 1864) and married to Margaret A. who’s 54. His parents are from “United States” and KY. They live in Earlington, Hopkins Co., KY. He’s a miner. There is also a James D. Vickers in the 1930 Census; he’s 66 years old (b. 1864) and living in Earlington, Hopkins Co., KY. His parents are also from Kentucky. Kenneth Downes or Dennis (8) lives with them; he’s his stepson. He’s married to Thelma (34). They just had a baby named Jannie F., who is two months old. But I can’t confirm these are the right James D.
She was born January 25, 1868 in Warren County, Kentucky. She died August 23, 1935, in Soap Lake, Grant County, Washington. She’s buried near her husband Charles Price, in Ephrata Cemetery, Grant County. She had no issue. Here is a summary of her niece Reba May’s (Willis’s daughter) handwritten account. Mary Emma (Aunt Emma) married when she was 16, to a poor old Dr. Lawhead, in Kansas, but she never told Reba where exactly. He had two sons, both young enough to be at home, but one was close to her age. They were so poor they couldn’t afford to buy her shoes. At an unstated date, they moved to Old Indian Territory, in Oklahoma. Then in about 1898, they moved back to Kansas. It was in Dodge City that she saw some travelers in old covered wagons, going to Utah. She befriended a large lady who may have suffered from a slight stroke, so she cared for her. The lady suggested she go with them, but she showed the lady her shoes and talked about her old husband and how they were so poor. Finally, “they” (Dr. Lawhead?) said she could go, after they got her some shoes. She moved to Ogden, Utah by covered wagon and lived there about two years. She worked cleaning rooms. Her older brother Samuel Vickers was living in the Dalles, Oregon, and told her she could get work in Seattle or Portland. It was around 1900 (see the 1900 Census, below). She traveled by train to Portland. She married a widower named Rob with two small boys, but Reba can’t remember his last name. It may be Brown. In 1908, she had some kind of surgery, and she survived because she believed the doctor put his spirit in her, and she was no longer just Emma Brown (? ), but somebody else (Reba put the question mark after Brown). Because of this “foolish” talk, Rob put her in a mental institution and divorced her. He found someone else. About six months after he found someone else, she walked out of the institution and got a job as cook in a logging camp. Then she got to Seattle and worked in a rooming house and met a “big, husky longshoreman” named Charles Price, in 1909. They got married that year. In the spring (year not stated) they bought property in Soap Lake, Washington. They lived there for 24 years, but then he had a stroke and died, in spring 1931 (sic). Reba’s father Willis went out there to try to sell the property, but apparently they didn’t sell all of it, because after a trip out to Kansas and Oklahoma, she and others will move back. Then in 1932 Aunt Emma traveled out to Oklahoma to visit Willis’s family and (our) Hannah Jane’s daughter Amy and Ella (two kids from Jane’s second marriage to Carl Frederickson; Hannah was Slim’s mother). Emma then visited Reba and her fiancé in Oklahoma City, in July 1932. Reba, her (now) husband Jack, and Emma left for Washington. The Great Depression helped the decision to go. On May 31, 1933, they arrived at Emma’s place. But in October 1933, Emma had a stroke, and Reba, a trained nurse, cared for her for a while. Reba was pregnant with Joanna, and getting far along, got a nurse to care for Emma Mrs. George Waltho, took care of her from then until May 1935. In December 1934, she could stand and take a few steps. But the nurse couldn’t stay for the duration, so Reba had to take Emma back and care for her new baby and an elderly man in her apartment complex. Emma suffered from an asthmatic attack and died in Soap Lake, just after her younger brother Willis and sister-in-law Rosa got there to visit her. Emma was buried next to her husband Charles Price, in Ephrata, Grant County, Washington. Reba does state the date, but it has to be after May 1935 (see the cemetery records, below, for an exact date). The censuses confirm the broad outline of Reba’s family account. In the 1900 Census, Seattle Ward 6, King County, Washington, Mary E. Lawhead is a 32-year-old widow (sic). She was born January 1868. She is from Kentucky (as are her parents). She’s a salesman, who rents her house. She can read and write. A 49-year-old lodger from Michigan named Ira A. Van Antwerp lives with her. He’s been married for 17 years, but his wife is not named or listed in the household. He’s a tailor. In the 1920 Census, Soap Lake District, Grant County, Washington, Marie (sic) E. Price is 51, from Kentucky (as are her parents), and her occupation is “none.” Charles G. Price is 45 and owns a livestock farm. He’s from Canada and moved to the US in 1892. They own their home free of mortgage. Jones S. Brock (or Brock S. Jones), 53, is a farm laborer from Pennsylvania. In the 1930 Census, Soap Lake, Grant County, Washington, Mary E. Price is 58 and from Kentucky (as were her parents), and Charles J. Price is 55 and from English-speaking Canada. He’s a farmer in stock. They have a boarder named William C. Brown, who’s 16. He’s a sheep herder (a shepherd). Their property is valued at $1600.00. Her obituary, whose specific date and newspaper name are not included in the copy sent to us by her niece Vivian. Mrs. Mary Price, 67, for twenty years of the soap Lake district and an Aunt of J. N. Bowen of this city, passed away last Friday after an illness of several months. Funeral services were held Sunday by Rev. Scudder of the Mission church at Soap Lake under the direction of the Jenkins funeral home of Ephrata. Appropriate songs were rendered by a mixed quartet with a special number by Loyal Houghton. Interment was made in the Ephrata Cemetery. Mary Emma Vickers was born near Smith’s Grove, Kentucky, on Jan. 25, 1868. Early in life she moved with her parents from Kentucky to Kansas, where she grew up and married to Dr. H. W. Lawhead, and at the opening of the Indian Territory they secured a homestead near Crescent City, Oklahoma. After the death of Dr. Lawhead she came west to Seattle where she met and married Chas. J. Price, a contractor. Together they settled on a ranch at the head of Soap Lake about twenty years ago, where they lived until the death of her husband May 6, 1930, and who was laid to rest in the Ephrata cemetery, where the remains of Mrs. Price will likewise rest. With her husband she joined the Adrian Grange, and has been a loyal and faithful member, and the pall bearers were selected from this organization in honor to her loyalty and support of this order. At an early age she embraced the Christian faith and was baptized into the Methodist Church. For many years her church work has been mostly administering to the needs of those about her. Mrs. Price comes from a family of nine children, having four brothers and four sisters, who have all preceded her in heath, except one brother, W. A. Willis of Weatherford, Okla., who was present at her bedside at the time of her death, and together with his wife, endeavored to relieve her suffering during her last hours. She has been a continuous sufferer from an asthma condition for nearly two years, during which time she has borne her affliction with patience. During most of this time her niece, Mrs. J. N. Bowen, has administered to her needs, but for the past few months has been under the care of Mrs. George Waltho, at the Waltho Hotel and Sanitarium in Soap Lake. In addition to her brother she leaves a score of nieces and nephews and a host of friends to mourn her loss. The many beautiful flowers contributed in sprays and bouquets from friends and relatives, gave evidence of the esteem with which she was held by all who knew her. Her brother Willis Alexander Vickers writes to Arch Frederickson, Wellington, Kansas, about Mary Emma’s funeral. Arch is Hannah Jane’s son, by Carl Frederickson, her second husband. Hannah is Slim’s and Bessie’s mother. Main Office: Soap Lake, Wash. The enclosed clipping relative to your aunt Emma’s funeral should have been sent to you some time ago, but as I have been so busy moving and doing other things it has been hard to settle down to do any thing . . . .
We came out in May with the idea of helping to take care of Emma and take Reba [Willis’s oldest daughter] to the hospital some time in June, which we did and brought her and a nice little grand daughter home. Then about July 1st Emma fell and dislocated her left hip, from which she never recovered . . . .
Had a nice letter from Bessie a short time ago. Said her and Frank were both away from home when Emma died or could have come over. Also said an operation some time ago for a hernia which bothered him quite a bit in his work as he was on his feet so much. Ada also wrote a nice letter and sent a lovely spray of pink and white carnations and we sure did appreciate these very much. Ours was a spray of gladiolas and astors. It was sure some consolation to me to be able to be here and do what little I could for her and look after this last duty . . . .
Rosa and the girls join in love and good wishes to all. He was born July 11, 1874 in Warren County, Kentucky; he married Rose Hubbard October 15, 1902 in Arkansas City, Cowley County, Kansas. Per the Washington State death index, he died November 26, 1953, Wenatchee, Chelan County, at 79, in the Wenatchee City Cemetery. Family tradition says he was buried November 30. Rosa was born January 8, 1878, near Oxford, Cowley County, Kansas. She died December 17, 1963, in Wenatchee. Her daughter Vivian says Rose’s name was Rosalinda, but she was called Rose. In the 1910 Census, Dill Ward 1, Washita County, Oklahoma, Willis A. Vickers is 35, a teller at a bank, can read and write, and is from Kentucky. His father’s from Tennessee (mistake), while his mother’s from Kentucky. Rosa H. is 32, from Kansas, and her parents are from Indiana. Her occupation is “none.” They have been married 7 years. She can read and write. They own their home (as opposed to renting it), but it is mortgaged. Their daughter Reba M. is 5, and she was born in Kansas. On September 1, 1918, Willis Alexander Vickers registered for the draft. He lived in Helena, Alfalfa County, Oklahoma. He was born July 11, 1874, and his age is 44. His wife is Rosa H., from the same place. He was a self-employed merchant. He was of medium build and height. His eyes were brown and hair black. In the 1920 Census, Enid Ward 2, Garfield County, Oklahoma, W. A. Vickers is 45, from Kentucky, and a real estate agent. He’s from Kentucky, and so are his parents. Rosa H. is 48 or 41 (it looks written over as a correction), and her occupation is “none.” She was born in Kansas, and her parents in Indiana. They own their home free of mortgage. Reba May is 15 and has been to school in the past year. She is said to have been born in Oklahoma (sic). Vivian is 5 and born in Oklahoma. Even she attended school in the past year and can also read and write. The parents can too. His nephew and niece Slim Ryland and Bessie (Ryland) Trebbe, son and daughter of her older sister Janie, may have visited them at least once, for the Rylands lived in Oregon around the same time. Here is a link to the obituary of Rose’s father, Jonathan J. Hubbard (scroll down a ways). They tell the story of the moves. The census record mishandles the age of the parents. Or maybe the error is in the 1850 Census. Errors like these are often found in the Censuses. The ages of some of the family are off, compared to the 1850 and 1860 Censuses. This is why Census records must be handled with care. They may be inaccurate. Page no. 11 [_? ]; dwelling no. in order of visitation: 76; family no. in order of visitation: 82; enumerated the 19th day of Sept.
Once again, it seems that the ages in the censuses don’t match up. Also note that James Vickers hired a black, Ben Jenkins, 11 years old, as a laborer. Page no. 14; dwelling-house no. in order of visitation: 82; family no. in order of visitation: 92; enumerated on 8th day of June; enumeration district: 239. Under the category “Occupation,” the sub-category “Number of months this person has been unemployed during Census year”: James Vickers has a check mark (no digit), and the same goes for Ben Jenkins. Between the 1880 Census (June) and Hannah Jane’s marriage to William Ryland (Dec. 4, 1883) in Sumner County, KS, James Vickers, Eliza Ann (Mansfield) Vickers and Hannah Vickers moved out to Sumner County. Family tradition says that Hannah’s older brother Samuel Jordan was the first to move out West. Hannah married William December 4, 1883, so it looks like they moved between the date of the 1880 Census and the date of Hannah’s marriage. Kansas has a mid-decade census. It is “minimal.” James is 61 (b. 1824), and Eliza A. is 54 (b. 1831). Emma is 17, and Willis is 11. James is a farmer. Interestingly a black family lives in the same household, or the census taker forgot to write down a new household number. Peter Hamilton is 75 and a farmer, Tampa (?) is 65, and Mary is 16. Maybe James and Eliza are taking care of the elderly couple. Recall that James and Eliza Ann’s daughter Hannah Jane married Carl Frederickson, April 3, 1890, nearly two years after her first husband William Ryland died. Here is Eliza Ann in the 1895 Census, living with her daughter. Carl Frederickson is 45, a farmer, and from Denmark. Hannah J. is 35 and from Kentucky. Floy (sic) R. is 9; Bessie M. is 8; Anna (sic) E. is 3; and Archie is 1. The kids are from Kansas. Eliza A. Vickers is 76 and (wrongly) stated as coming from Kansas. This census shows that Eliza Ann is living with her daughter Hannah Jane and her children little Floyd (Frank) Rucker and Bessie May. So we have three generations: Grandmother Eliza Ann, mother Hannah Jane, and son and daughter Frank and Bessie. We also find Frank’s and Bessie’s half-brothers and half-sisters, Amy Elsie, Archie Andrew, and Ella Hazel, children of Carl Frederickson and Hannah Jane. The Census data, not included in this Table, say that Carl Frederickson immigrated in 1866, and had lived in US for 33 years. So he was 17 when he took the big step. It looks like Carl hired a farm laborer. Dwelling no. in order of visitation: 92; family no. in order of visitation: 92. Enumerated on 8th day of June 1900. The 1910 Census, not included in this file, (Sheet 6B, Guelph Township, Sumner Co., KS) shows Carl Frederickson by himself, at 60 years old, “single” (not “widowed”) a farmer, renting a farm, not naturalized. Reba May Vickers (b. May 27, 1904) was the oldest of two daughters of Willis Vickers, and he was the son of James Thomas Vickers and Eliza Ann Mansfield Vickers. In Reba May’s family history, written on December 27, 1978, she recounts why Eliza Ann Mansfield Vickers decided to return to her home state of Kentucky. I have heard them [Reba May’s parents, Willis Vickers and Rosa Hubbard Vickers] tell how awful homesick grandma Vickers [Eliza Ann Mansfield Vickers] got to see her daughter nancy [sic] in Kentucky and she almost worried them to death and my father did not have the money to send her and Nancy didn’t have the money to send her either so finally my grandfather Hubbard thought it was going to be hard on my mother carring [sic] me under such conditions, so he paid for my Grandma Vickers railroad ticket to Kentucky. I think after my father was able some years later he paid him back. The original letter, of which I have a copy, is in the possession of Allan and Jeanette Cox, who worked on a genealogy of the descendants of the Vickers and Mansfields. I have a copy, and it has some amusing anecdotes of the siblings of Hannah Jennie: Samuel Jordan, Mary Emma Vickers (known by Floyd [Frank] Ryland as Aunt Emma), and Willis Vickers. Let’s return to Kentucky before their move to Kansas. In these tax records, Samuel is the father, and James is his son. Nacy is Samuel’s son and James’ brother. It seems that none of them were wealthy. Near Hunnewell Township, Sumer County, Kansas: October 19, and November 16, 1887. You are hereby appointed to appraise, on oath, the personal estate and effects comprised in the inventory of the estate of James T. Vickers, deceased, at such time and place as may be designated by the Administration of said estate. James T. Vickers} Inventory and Appraisement, etc. Estimate and Appraisement of the Personal Property and Effects of said Estate. Statement of All Goods and Chattels of Said Estate. Description of Property. Estimate of Val. Description of Property. Estimate of Val. I H. W. Lawhead do solemnly swear that I am the Administrator of the above and foregoing Estate and that as such administrator I have made diligent search & can find no personal property of any kind or nature whatever to inventory to said Estate and to the best of my Knowledge & belief there is no assets or property of any kind whatsoever belonging to said estate. Subscribed and sworn to before me the 16th day of November and 1887. FOR THE USE OF HERSELF AND CHILDREN OF THE DECEASED. A researcher living in Sumner County informs me that James and Eliza Ann lived in Hunnewell, Sumner County, Kansas, right on the Oklahoma border and Kay County (an Oklahoma county). James’s probate – legally confirmed in a court of law – shoots down the theory of one online researcher that says James migrated to Texas and died there. His probate says he died in Sumner County, Kansas. Alternatively, I suppose it is remotely possible that he could have died in Texas on a visit, but then was brought back up to Kansas. Since Eliza Ann lived a very long time, we have her death certificate. The informant was George Baldock, who is descended from her daughter Nancy, so he is Eliza Ann’s grandson. The certificate says Ann Mansfield Vickers, a widow, died in Voting Precinct 16, Smith’s Grove, Barren County, Kentucky. She was born April 13, 1828, in Hart County, Kentucky. Her occupation was “Housekeeper.” Her father was James Mansfield, born in Kentucky, and her mother was Frances Greer, also born in Kentucky. She died January 8, 1916, and was buried January 9, in Lockhart Burying Grounds (now Lockhart Cemetery). The cause of death was mitral insufficiency. Note that the above link also says Mansfield. This entry was posted in Family History and tagged James Thomas Vickers Eliza Ann Mansfield by james malcolm. Bookmark the permalink.